If your children play football or any contact sport, do they face the risk of injuring their head? Yes. If he or she never experiences a concussion, are they risk-free from any negative changes in the brain? No. Researchers have recently uncovered that change to the white matter in the brain is apparent even if the athlete has never suffered from a concussion. Most young athletes never seek treatment for head injuries, such as receiving an MRI, unless they are diagnosed with a concussion. Wake Forest University and Virginia Polytechnic Institute and State University studied six football teams with players ranging from 6 to 18 years old. The researchers placed accelerometers in the helmets to track every hit during the football season including practices and games. They concluded that one season of football can produce mild traumatic brain injury without the player having a concussion. If your child is involved with contact sports, it is important to look for any signs of injury. Since the brain is still developing, head trauma poses a serious threat. If your son or daughter shows any sign of decreased cognitive function, an MRI may be needed. Check with your league, school, or district about concussion policies. It is important for parents and athletes to sign the concussion policy statement. This statements guides players as to when they can return to the sport. It also establishes a pledge to safety along with information about concussions. Insist safety comes first. Remind and teach players that it’s not smart to play if you have suffered any type of head injury, no matter how mild. Even though fellow teammates may encourage them to return or your child insists that he or she is okay, let them rest. The brain needs time to heal and they should not return to the sport until a health care professional has cleared them. Keep track of concussions & head injuries Parents or students should report the injury to the league or school. That way the athlete’s behavior and recovery process can be monitored, especially if the child plays multiple sports. How much will an MRI cost? Beware of high-priced hospitals that can charge as much as 60% more than an outpatient facility like Shields MRI. Remember to ask about technology, the radiologists and appointment times. High-field MRIs, an experienced radiologist and a timely appointment can make a big difference in your child's treatment plan. Shields MRI commits to excellence and low pricing. Our price is up to 60% lower than our competitors. You can expect the best care for the best price. Sources: "What Can I Do to Prevent Concussions?" Centers for Disease Control and Prevention. Centers for Disease Control and Prevention, 15 Apr. 2013. Web. <http://www.cdc.gov/concussion/sports/prevention.html>. Barnes, Eric. 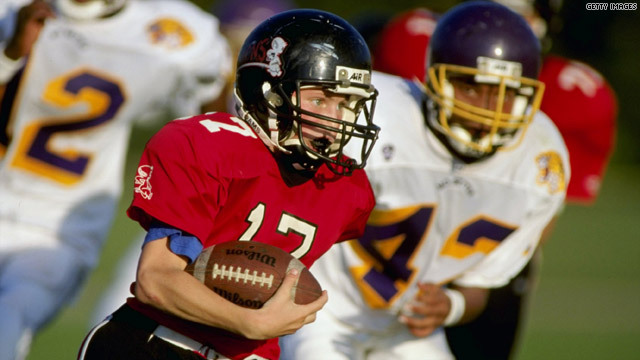 "MRI Reveals Football's Toll on High School Athletes." AuntMinnie.com. N.p., 10 Apr. 2014. Web. <http://www.auntminnie.com/index.aspx?sec=sup&sub=mri&pag=dis&ItemID=107089>. Note: This blog author is not a physician; content is for informational and educational purposes and does not dispense medical advice. Please see your doctor if you have any questions or concerns about concussion, head injury or think you may need an MRI.